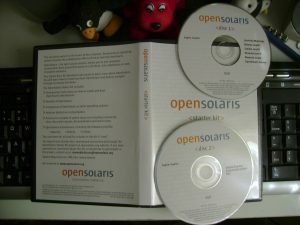 OpenSolaris is open source computer distro based on Solaris created by Sun Microsystems. It’s free! Inside you’ll find tutorials, documentation, and two DVDs filled with useful software. Get started using OpenSolaris technology — right on your laptop or home PC. Solaris Express — Preview future features of Sun’s Solaris Operating System. Also inside: ZFS, DTrace, Containers, and hundreds of other unique features. Sun Studio compilers — Get advanced features for developing applications on Sun Solaris platforms. System Requirements — x86/x64 based system. There are no shipping and handling fees associated with ordering the OpenSolaris Starter Kit, so request one today! Feature: ZFS, DTrace, and Containers.